Trilingual border signs now include Mohawk language in Cornwall, Ont. The border crossing at Cornwall, Ont. now has trilingual signage, adding Mohawk to the English and French in a collaborative effort to foster reconciliation. The border crossing at Cornwall, Ont. now has trilingual signage featuring messages in Mohawk alongside English and French — part of a collaborative effort to foster reconciliation with First Nations. 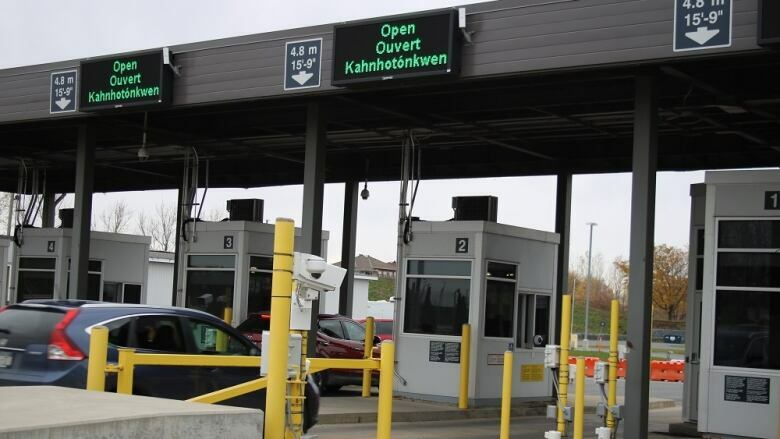 It's the first port of entry in Canada with signage in the Mohawk language and is "representative of ongoing efforts by the CBSA to work in partnership and respect with Indigenous communities," says a news release from the Canada Border Services Agency. Last year, more than 1.5 million travellers were processed at the Cornwall crossing, and more than one million of them were residents of the Mohawk communities of St. Regis and Akwesasne. Abram Benedict, grand chief of the Mohawk Council of Akwesasne, said Mohawk is the first language for many residents and elders in the community. "The use of our language on the signage at the port of entry is an acknowledgement of daily users of the crossing, and the fact that the port is on traditional Akwesasne lands," he said in a statement. "We wish to continue to advance our partnership with CBSA in order to meet the needs of Akwesasronon." CBSA president John Ossowski praised the new signs. "Our relationship with the Akwesasne community is important and the new signage is but one step on the CBSA path towards reconciliation," he said in a statement. The Iqaluit port of entry also has signage in English, French and two Inuit dialects.